Thomas Jefferson's birthplace, at his family's Shadwell (Virginia) home, burned to the ground in 1770. 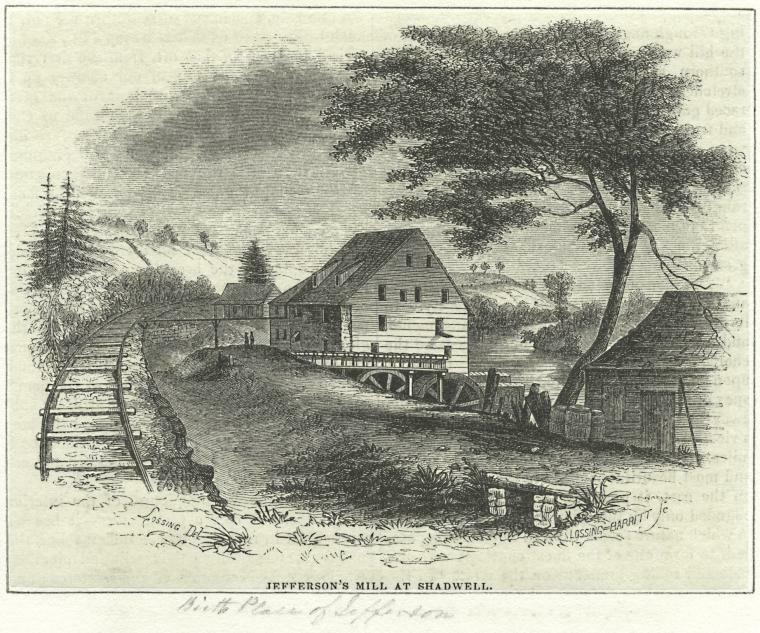 This is an engraving of the Shadwell mill. Engraving by Lossing & Barritt. Online, courtesy New York Public Library Digital Gallery; Digital ID: 1253619. EDITOR'S NOTE: American railways did not exist when Jefferson was born and lived at Shadwell. Shadwell, the Jefferson family home, burned in 1770. Little of value survived, except Tom's violin. Nothing is left to examine except a marker, although archeologists have worked at the site over the years. Throughout his long life, Jefferson lost many people who were close to him. Death, in the eighteenth century, was a frequent family visitor. His father, for example, died suddenly - in 1757 - when Tom was only fourteen. Peter left "to my son Thomas" his treasured possessions: land, books and mathematical instruments. He also left explicit instructions about Tom's immediate future. The boy was to receive "a thorough classical education." Acting on her husband's wishes, Mrs. Jefferson sent her son to the log-cabin Classical School for Boys, run by Dublin-born clergyman James Maury. Tom lived at the Albemarle County school for two years, coming home on weekends and holidays. Some persons were to be sent in search of that river Missouri, if that be the right name of it, in order to discover whether it had any communication with the Pacific Ocean. The "French and Indian War" interfered with such exploratory plans, but the desire to discover a passage to the west coast continued. Who can say how long Jefferson pondered Rev. Maury's comments - and his own father's role as a map maker - before he personally sent Lewis and Clarke to explore the Missouri River? Bos, Carole "TREASURES ... LOST and FOUND" AwesomeStories.com. Jul 01, 2008. Apr 23, 2019.